Memorial Day weekend is traditionally the time when gardeners buy many of their plants to transplant into their gardens. 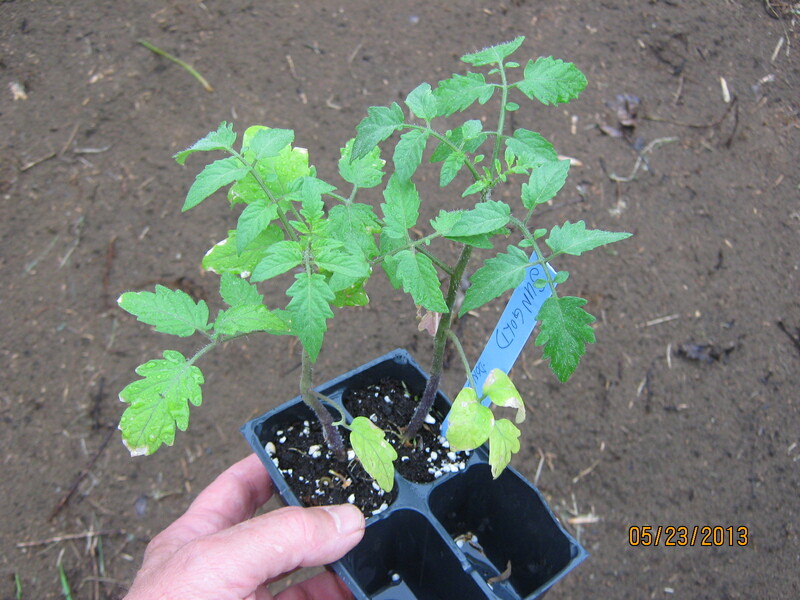 Symptoms of sunburn show up as light spots on the tips of these tomato plants. Our daffodils, tulips and hyacinths are done blooming for the season. That doesn’t mean that we can forget about them. There’s still some work left to be done that will greatly improve our chances for flowers next year. Small pruning snips work great for removing seed stalks. The problem with seed pods is they take too much energy to grow and we don’t need seeds to grow tulips, hyacinths or daffodils. To conserve that wasted energy, we need to remove those flower stalks as soon as possible after the flowers have faded. I try to cut the flower stalks as close to the base of the plant as I can being careful not to cut off the leaves. Plants need their leaves to produce energy for growth, reproduction and other plant functions. Last week, the eggs hatched. In the photo you can see how small and seemingly helpless they are at this stage of their life. They are less than one-sixteenth of an inch long. A single rain drop could probably crush a baby caterpillar if it landed right on it. Or, at the very least, wash it from the tree branch. 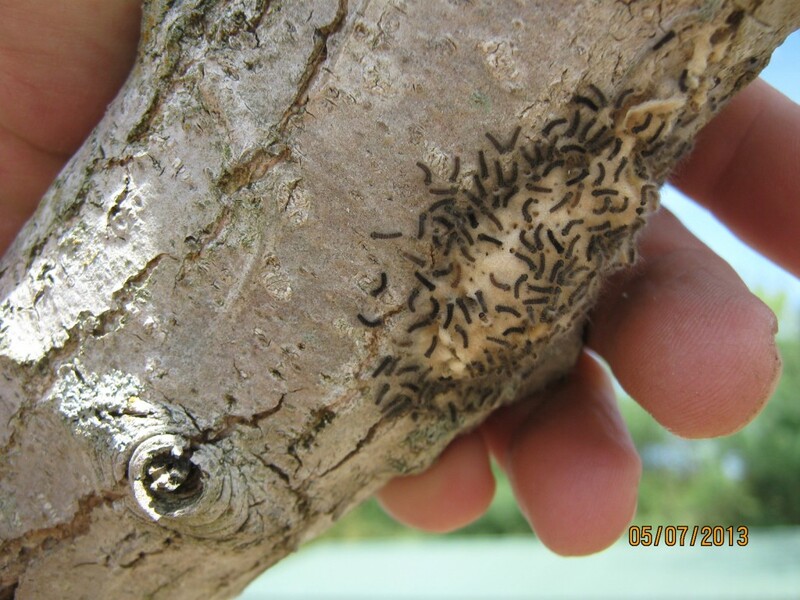 Over one hundred gypsy moth caterpillars hatched from this egg mass. Bees and butterflies are fun to watch but, I think hummingbirds are the most fascinating visitors to a garden. No matter how many times you see them, they never fail to surprise and amaze. Hummingbirds use a huge huge amount of energy in relation to their size. Sugars found in flower nectar is source of this energy. Everyday they eat their body weight in nectar so they are constantly on the lookout for nectar-producing flowers. You can encourage hummingbirds to visit your yard by planting the flowers they’re looking for. They prefer red and orange tubular flowers but will feed on most brightly-colored flowers with nectar. There’s plenty of flowers that meet these requirements. Hummingbirds like tubular flowers such as petunias and nicotiana. Here’s a partial list to consider: monarda, red salvia, agastache, honeysuckle vine, fushia, verbena, phlox, butterfly bush, daylily, trumpet creeper, cypress vine, coral bells, heirloom petunias, penstemnon, morning glory, bugle weed, red-hot poker, and many others. Like people, hummingbirds also need protein and fats in their diet. They get those nutrients by eating gnats, mosquitoes and other small insects. So, having an area of wild plants — weeds — nearby will provide space for these small insects to grow. Finally, hummingbirds need trees and shrubs to provide a place for them to nest and to escape from predators. If you look around, you’ll probably see that most of the things hummingbirds need are already in your neighborhood. Planting the right kind of flowers is the best way to get hummingbirds to hang out in your backyard.